Santouka is doing ramen right in Toronto. Yes! Things have been busy with NaNoWriMo going on - I apologize for the lack of blog posts this month! I did, however, want to say a few words about Santouka Ramen, the new shop that soft-opened last week on Dundas East. A friend of mine works here and she recommended it very highly, so I made an effort to check the place out before word had gotten around too much. I wasn't even thinking about writing a review on it, so I never stopped to take any photos, but after we walked out of the shop, I began jotting down notes -ah, blogging life! It looks like I was just in time, too - in the week since I visited, at least a dozen food bloggers have gotten to Santouka and the lines are apparently around the block. Their grand opening is today, and I can guarantee that it's going to be quite a lot harder to get in there without a wait after this. The shop is just a little east of Yonge-Dundas Square, and initially I imagined that it would be competing with Kenzo and possibly Kinton for the customers in the area, but it looks like that isn't the end - buzz is starting to get around for a new shop on Gerrard called Raijin (also specializing in tonkotsu ramen) and of course Sansotei (which I haven't been to yet) is doing quite well for itself. A far cry from when I first moved to Toronto and only had Kenzo and Ajisen to choose between - and that was barely a year and a half ago! 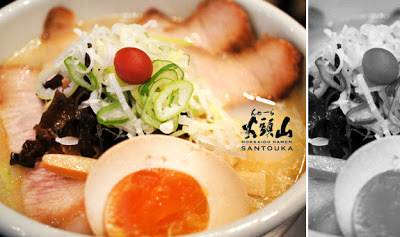 Santouka looks to be a fierce competitor, though - they are a branch of a chain that has been operating in Hokkaido since 1988, whose owner was apparently inspired by the famous ramen film Tampopo. Apparently, there was a branch right in my town in Japan, at a shopping centre I visited often, but I wasn't nearly as much of a ramen fiend then as when I returned to Canada and started missing Japanese food! The fact that Santouka is Japanese-run is really encouraging (not knocking you, Ajisen, but those Chinese chopsticks are awful to eat noodles with) because I know Toronto is inching more and more toward authentic Japanese food. They have the same menu in all their overseas shops - the first Canadian branch was in Vancouver. Toronto's version of Santouka appears to be very close to the original as well, of course. My shio ramen (salt-broth) came topped with menma (bamboo shoots), kikurage (jelly ear mushrooms), char-siu pork, naruto, and a single umeboshi - pickled plum. The umeboshi came as a bit of a surprise to me, as I'd never seen one topping off a bowl of ramen before. 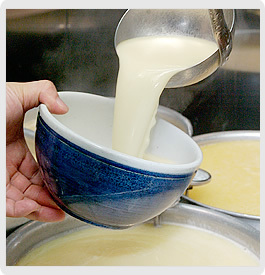 Many of the "usual" toppings you'll find at local ramen places (corn, egg, etc) should be ordered separately at Santouka, as each type of ramen has its own set toppings. The shio is the only broth that comes with an umeboshi. their broth for 20 hours! I found my bowl very hearty, but a tad too salty in comparison to other broths I've enjoyed - even for salt-broth ramen, it was a bit overwhelming for me. I hoped it was an isolated incident, but other reviews seem to indicate that this is characteristic of their recipes. My companion, enjoying the kara miso version, did not have the same complaint. That is not to say that I didn't enjoy it - it was excellent, and the size of the meal was pretty much perfect, but I might go for a different type of broth next time. And definitely their specialty, tokusen toroniku - wish I'd given this a shot the first time! I also ordered as part of the set menu, which meant that I also received a rice bowl, pickles and egg on the side. The egg is my favourite part of a ramen meal, so this was an obvious choice for me, and I went with the char-siu donburi; succulent char-siu and greens atop a bed of rice. The egg was more hard-boiled than soft - it was even a little bit cold, but after spending a few minutes in my soup, it was delicious. The taste was perfect. Somehow I even ended up with two eggs - I think I have one of the kind serving staff to thank for that! It's a real relief to see the ramen competition increasing in Toronto, and Santouka is doing it absolutely right. The atmosphere of the shop is perfect - I loved the wooden bench seats. The food was excellent and the staff friendly and prompt. I had a nice conversation with our server, who was from Kyushu - now there's some quality ramen! My only issues were the price (a little steep, but that's my complaint about just about every Japanese restaurant in this city except Okonomi House) and the amount of seating. The capacity is definitely going to be an issue for this shop, as there weren't nearly enough seats, and even though we walked in without a wait at 4:30 on a day before the opening had really been made public, by the time we left the line was out the door. It's going to be awhile before you have any hope of slipping into any downtown core ramen restaurant without a wait, though - be patient, because when that bowl of steaming noodles is set in front of you, it's all going to be worth it!